Capitalising on the success of its “Modern Classics” range, launched last year, Triumph introduced two “custom” models, designed for two very different riding styles. 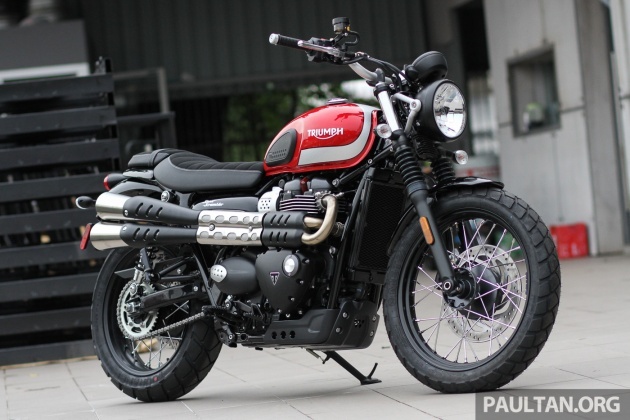 Now in Malaysia, these are the 2017 Triumph Street Scrambler, at RM65,900, and the 2017 Triumph Bonneville Bobber, priced at RM74,900. These two retro-styled machines join the recently released 2017 Triumph Street Cup, which hit the showroom in February, and retails at RM65,900. Joining the list for new releases in 2017 for the Modern Classic series of Triumph bikes are the T100 and T100 Dark, which go from RM63,900 for the Jet Black colour scheme to RM65,900 for the dual colour schemes. 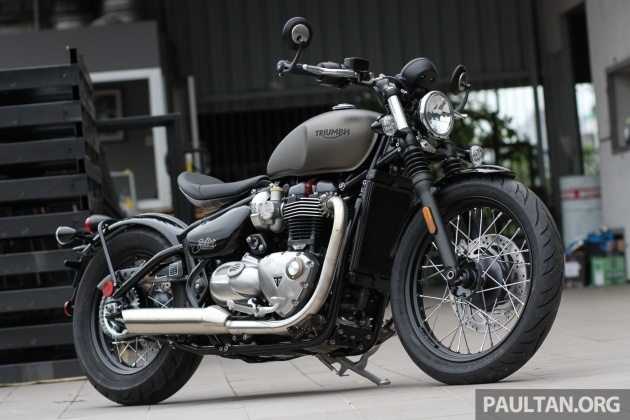 Based on the T120-series Modern Classic street bikes that entered the Malaysian market last year, the 2017 Triumph Bonneville Bobber carries the same 1,200 cc mill as the T120. This liquid-cooled, eight-valve SOHC parallel-twin engine puts out a claimed 76 hp at 6,100 rpm and 106 Nm of torque at 4,000 rpm, fed by multipoint sequential EFI. Cut in the classic “bobber” style, the Bonneville Bobber is a single-rider affair, with a seat height of only 690 mm, and 228 kg dry weight. Braking uses a single disc front and rear, sized at 310 mm and 255 respectively, grabbed by Nissin callipers, with ABS standard equipment. Also standard is ride-by-wire and traction control, with road and rain riding modes. A Torque-Assist Clutch makes light work of clutch usage and the LCD multi-function instrument panel contains an analoque speedometer and digital readouts for all the necessary information, controlled by the switch on the left handlebar pod. Suspension on the Bobber is with standard telescopic forks with 90 mm of travel, while the rear end is propped up with a KYB monoshock, with a progressive linkage that gives 76.9 mm of swingarm movement. Tyre sizes, for that bobber hardtail look, is a 19-inch spoked wheel in front, and a 16-incher at the back. On the more action-oriented side of things is the 2017 Triumph Street Scrambler, an adjunct to the Triumph Street Cup. Taking its cue from Steve McQueen’s 1964 TR6 Trophy that he campaigned in the International Six Day Trials in the then East Germany, the Street Scrambler is an update of the sixties scrambler style. Using the same 900 cc, eight-valve, liquid-cooled SOHC power plant with 270-degree crank angle parallel-twin as the Street Cup, the Street Scrambler is claimed to have 55 hp at 6,000 rpm and 80 Nm of torque at 2,850. Fuelling is taken care of by multipoint sequential EFI, and a ride-by-wire throttle is standard. Weighing in at 206 kg dry, the Street Scrambler carries its exhaust pipes tucked high-and-tight on the right, in the traditional manner. Braking is with a 310 mm single disc in front, and a 255 mm disc at the back, with Nissin callipers. ABS is standard fitment on the Scrambler and can be switched on or off for off-road fun, where locking the rear wheel into turns increases the “whee!” factor. Also standard is traction control, and like the ABS, can be swtiched by the rider for riding and terrain conditions. The Street Scrambler’s seat height of 790 mm brings it into “normal” motorcycle territory, and ground clearance is adequate, with a bash plate to take care of the engine if the bike bottoms out. Suspension is by KYB, with a 120 mm travel telescopi fork in front, and twin pre-load adjustable shocks in the back with 120 mm of travel. Spoked wheels complete the Street Scrambler’s retro look, with a 19-inch hoop in front and a 17-incher in the rear. Fuel is carried in a 12-litre tank. There are five colour options for the 2017 Triumph Bonneville Bobber – Black, Ironstone, Morello red, two-tone silver/red and silver/green. For the 2017 Triumph Street Scrambler, three colour schemes are on offer – Jet Black, Korosi Red/Frozen Silver and Matte Khaki Green. OMG at these prices? Really shows our ringgit got no value. Become like Zimbabwe. YES! Remember dun vote Team Oppo! Their manager is the one ruined it for 22 years. Say no to Oppo! Real cheap RM65,900 = 20K SGD..
Bro. Belum tambah 10X untuk COE and 7% GST. After travel JB-Bangkok, u WILL feel the heat, literally. U probably din ride one, either. I just quickly browse through this article and when i saw the price tag, i was like seriously, can it sell more than 10 units per year? BMW Motorrad sold 1,004 motorcycles in Malaysia last year, a 16% increase from 2015. There is a market here for big bikes.